Wood Floor Moldings are used to cover the expansion area, level height differences between adjacent flooring, hide cut ends and accent the floor. Quarter Round is always attached to a wall; it covers the necessary gap between floor and wall. Adds a beautiful finish to your trim and as well as a professional finish from the floor-to-wall transition. Coordinating easy to install trims and moldings are available for all Mohawk hardwood floors. Ready to install; no painting or staining is required. Buy online Mohawk Chocolate Hickory 3/4 in. Thick x 3/4 in. Wide x 84 in. 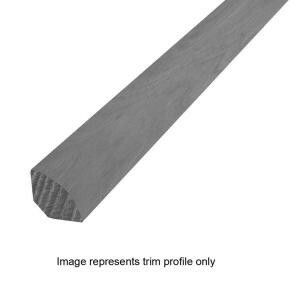 Length Hardwood Quarter Round Molding HQRTA-05285, leave review and share Your friends.